This third week was a surprize for all of us not because of the typefaces projects but because of the temperature: every new day, the temperature was even higher than the previous day. It wasn’t an easy context to work hard on typefaces. For Monday 29 June morning, they have to complete on tracing paper the keywords in lowercases and capitals: hanfigecplurosty, HANFIGEPLUROSTY. Quickly after, some of the attendees jumped on the computer, scanning their lowercases, transforming the shapes draw by hand into outlines. Malou Verlomme spent the full day with the group to help them to correct their shapes, terminals systems, serifs sizes, choices they made depending the style of their typeface. The objective was to be ready as possible for the next day. On Tuesday 30 June, Rainer Erich Scheichelbauer, from Glyphs, was with us for a full day. Mathieu Réguer started with a review of font formats, digitization principles, comparing different tools and technics. Soon after, Rainer Erich Scheichelbauer was focusing on Glyphs as design tool. His presentation was really enjoyable, because of his unique style to explain complex things with a high dose of humour. But also because Glyphs is a really intuitive tool, specially for beginners like Type@Paris attendees. As past weeks, Wednesday are dedicated to the type crit in parallel to the normal course. This Wednesday 1 July we welcomed Henrik Kubel, who was late because of trip problems due to high temperature in France and United Kingdom. So, the type crits started around 1 pm, in a compacted version as much as possible until 6 pm. Every hour, a group of attendees visited Henrik when the rest of the class staying with Malou Verlomme and myself. This new Wednesday type crit session was fabulous. The confrontation with various professionnal typeface designers is complex for attendees but an absolute necessity. When you’re on the learning curve of a new topic, this time typeface design, each day came with some new surprises, new ideas. It’s really difficult to keep control on your initial ideas, without the wish to transform everything everyday. Students have to learn how to deal with new comments, without destroying their own design just to test something new. Question of balance almost impossible to adjust but so intensely good. The Talks are in a separate place, called (Le Tank,)[http://letank.fr] a co-working space near Bastille in Paris. Each Wednesday two speakers and a facilitator. This evening was special, as one of Type@Paris attendees was the first speaker of the evening: Claudia de Almeida! Along Henrik Kubel, they presented incredible projects: how to be hired by Wired as design director, Real Simple redesign, Margaret Calvert collaborations, signages typefaces for Moscow métro, typefaces for New York Times magazine. Fascinating evening; watch the replay More #tptalks15 on Wednesday 8 July: Register now! On Thursday, it was the last session with Malou Verlomme. After a day with Henrik, students had to synthesize the comments made by Henrik: how certain things had to change in their project. Malou was with them for that, and also here to help to finalize they letters shapes on key words used as starting point to work on the extension of the full typeface. I was with the group for the afternoon. I started with a long session about what make a typeface a consistent system: from basic things like weight ratio between caps and lowercases, how to design figures to how works em, en proportionality on punctuation widths, figures widths, or spacing concepts. I have spent the rest of the afternoon to help each attendee, focusing on adjustment the counters of their main glyphs, in order to improve the consistency of their full typeface. Designing a new typeface isn’t just a game based on the contrast ratio and serifs, terminals. Learning typeface design is: learning how to see the empty space around shapes, learning how to make the counters of various glyphs working together well, learning that the global letterform structure is more crucial than unique asymetrical serifs. Type@Paris crew in front of Table Claudienne, at Musée de l’Imprimerie. We enjoyed a lot to be able to look at the Musée de l’Imprimerie unique collection. On the afternoon, after a long walk in Lyon, we discovered the most impressive collection of Roman inscriptions at Musée Gallo-Romain: more than hundreds of inscriptions one place. 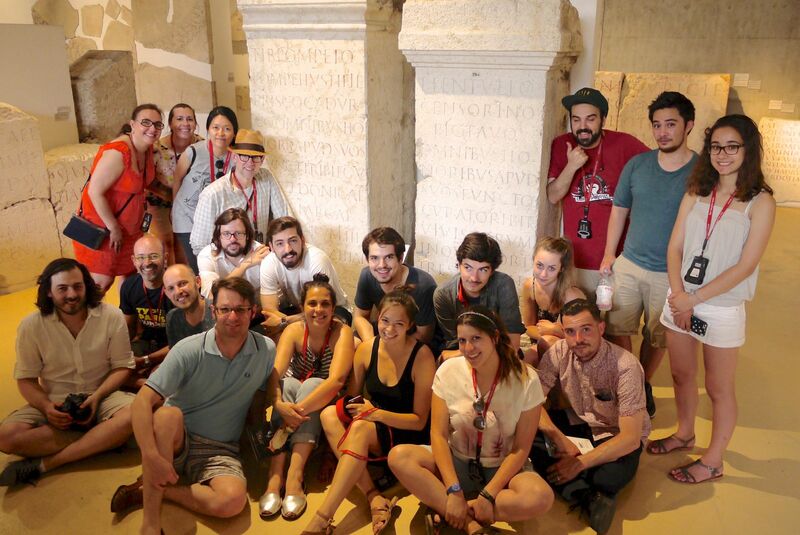 We spent a fantastic time on front of beautiful romans capitals. A very inspiring moment for all of us. Extract from the collection of Roman inscriptions. It’s what happening when 20 typophiles are together in a museum! → Register now for #tptalks15 8 July 2015 featuring Laurence Madrelle + Lucas de Groot.